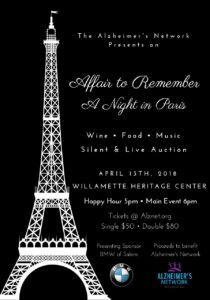 The Alzheimer’s Network presents our 8th annual “Affair to Remember.” This is our semi-formal spring event that raises money to support the mission and work of our organization. The evening will host, dinner, wine, silent auction, wall of wine, music and a fun time. Tickets are $50 per person and $80 for two. We look forward to seeing you all there.